Homeowners looking to install their own lawn should look to their local sod farm. 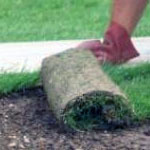 This will give the lowest price and the freshest sod. For those looking for Vancouver, WA sod or Portland, Oregon sod should look to Far West Turf Farm. They offer both U-Haul and delivered sod that is cut fresh and pelleted that morning. Measure your future lawn area in length x width in feet. Multiply the two numbers to get square feet. If you have an irregular shaped lawn, break it down into manageable squares and measure each separately. Add up your lawn areas and add 10-15% to make sure you have enough and to allow for trimming as you install. Sod is only slightly more expensive than seed and it gives an instant lawn the very day you lay it down. More on sod installation. I have approx. 2000 sq feet I would like to lay in sod, what would it cost and is now a good time to place before the heat hits? with then you can write oor else it is complex to write.